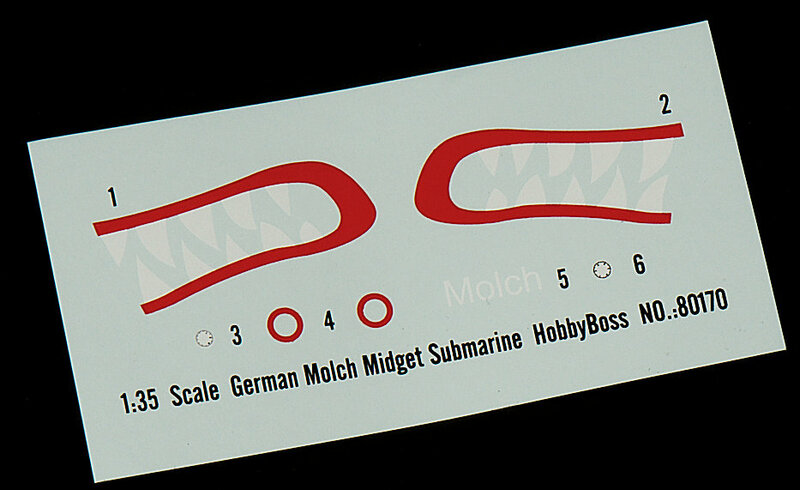 Hobbyboss has taken on a few unusual kits recently, one that got our attention was a replica in 1/35th scale of the German WWII era "Molch" (Salamander) Midget Submarine in injection moulded plastic and photo-etch. 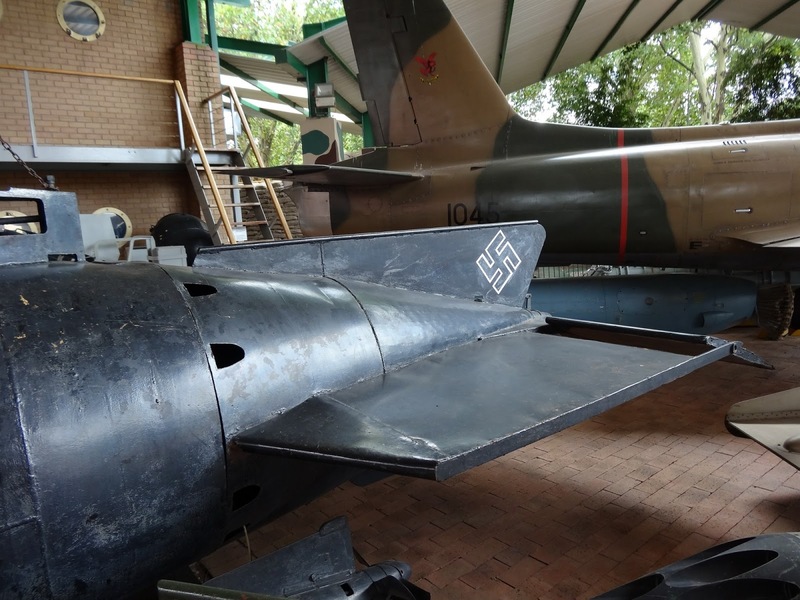 It had interesting box art that showed off the retro/futuristic looking shape of the submarine, and seeing a few of the "Biber" and "Seehund" submarines made up I was keen to have a look at this one. Knowing about the kit and its competition was fine - but what about the real thing? The German "Molch" Midget Submarine (Salamander) was designed by Dr. Heinrich Drager, it was the first one-man U-boat of the Kriegsmarine. The Molch was driven exclusively by electric motors. Shaped like a long cigar, it carried two underslung G7e torpedoes and had a limited range of 50nm at 2.9 knots. 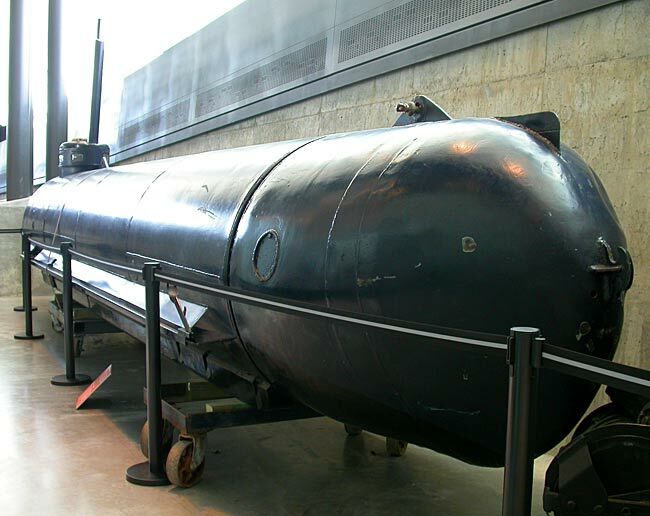 This submarine was based on torpedo technology and powered only by electrical propulsion. Unlike a standard U-boat, the Molch could not operate above water level, its engine was designed to function exclusively under water. With its operational distance of only 64 kilometres just above 9 km/h, the Molch was designed for coastal missions. 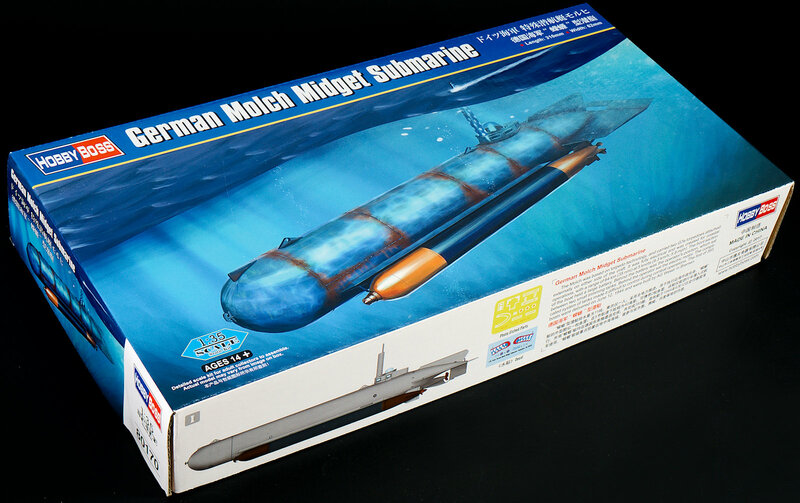 It was a huge step forward in midget submarine design. It had a longer range than its predecessors and it had a periscope. On top of the Molch was a cupola with Plexiglas windows. For vision, it was equipped with a plexiglass cupola and had a periscope which could be rotated 30 degrees on either side. The controls were simple and rudimentary and most were equipped with a compass and a simple hydrophone for detecting distant sounds. As the Molch did not have an engine for surface running, this meant that it suffered from very limited endurance. To compensate for this, a large proportion of the hull was allocated for battery storage. 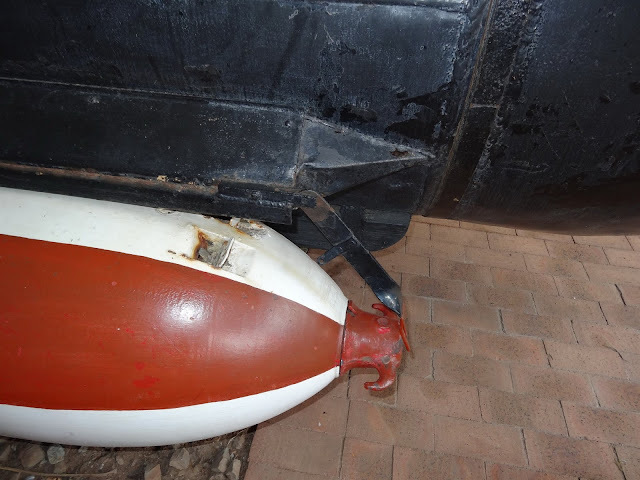 This resulted in a positive buoyancy which made the submarine almost impossible to dive. As a result, the submarine was robbed of a vital asset – concealment. First delivered in June 1944, the Molch saw action at Anzio, Norway, the Mediterranean, and Denmark and was mostly used for coastal defence. Although there were some successes, the losses incurred were greatly out of proportion to the sinkings they afflicted. 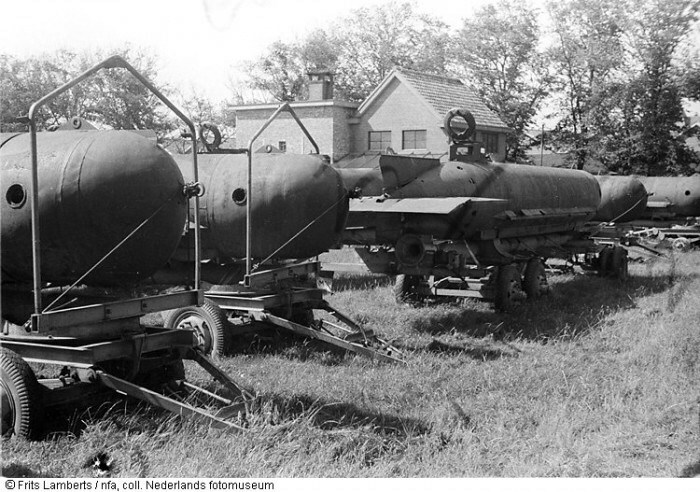 The Molch was used mostly in reserve to the Biber, as that was considered to be a more advanced submarine. A total of 393 were built, mainly by AG Wesser in Bremen. Here is an excerpt of an interesting video about the Molch. 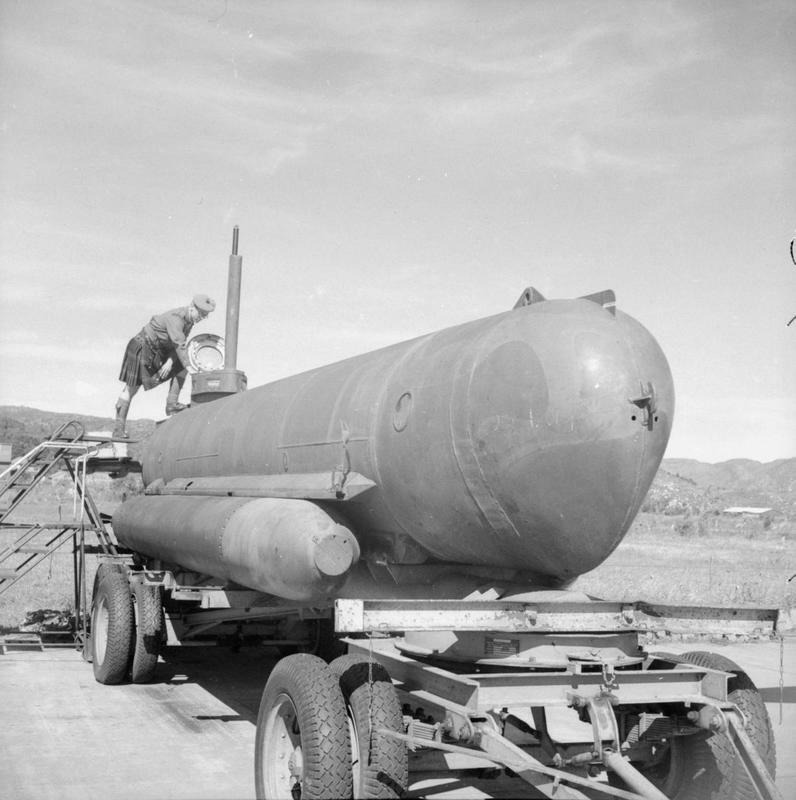 An officer of a Highland regiment inspects a German Molch (Salamander) one-man submarine at Solar aerodrome, Stavanger, Norway. 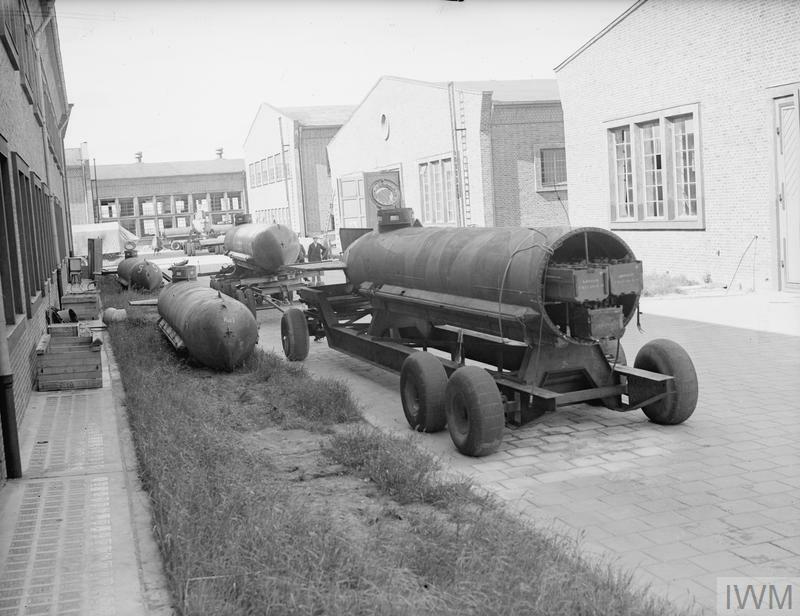 These trailers made the Molch easy to deploy and hide, they needed no large base to house them. Simply winched in and out of the water or backed into the water on a slipway on the trailer. Even while it was more advanced than it smaller predecessors it was hard to control the Molch in combat. 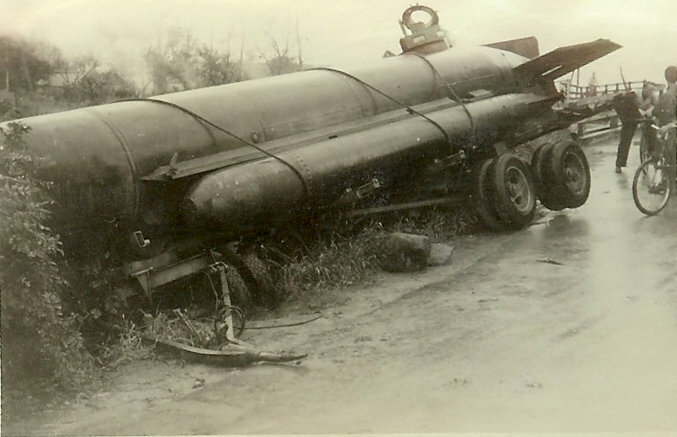 Buoyancy was hard to control, it had a large turning radius and had dive planes that interfered turning control. Its slow speed an low depth made it a relatively easy target. 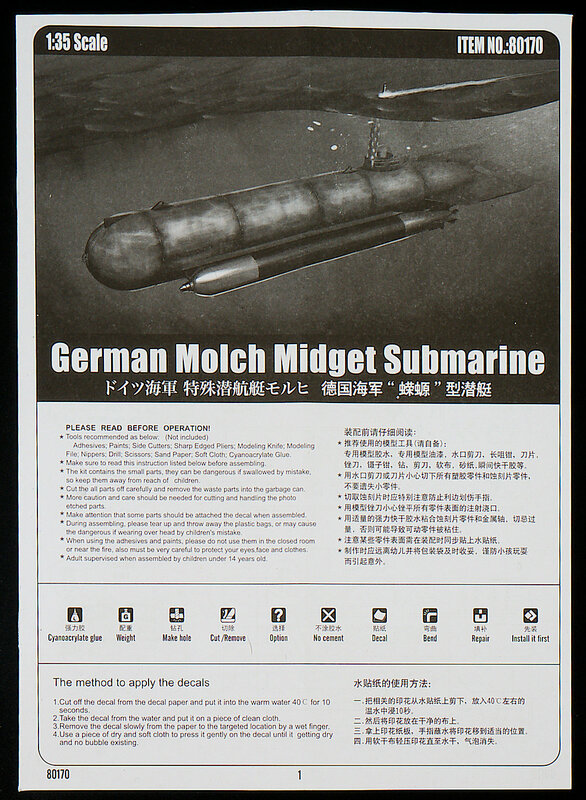 Lots of Molch submarines did not come back to port due to mechanical failure or were sunk by the Allied forces. The first Flotilla was stationed in Italy in the Mediterranean sea, it saw action during Operation Dragoon on the night of 24th – 25th September 1944. 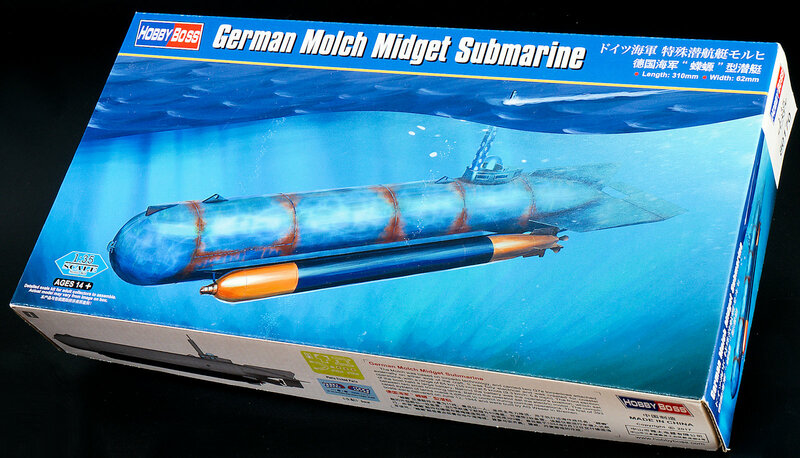 Losing most of their submarines the operation was unsuccessful. 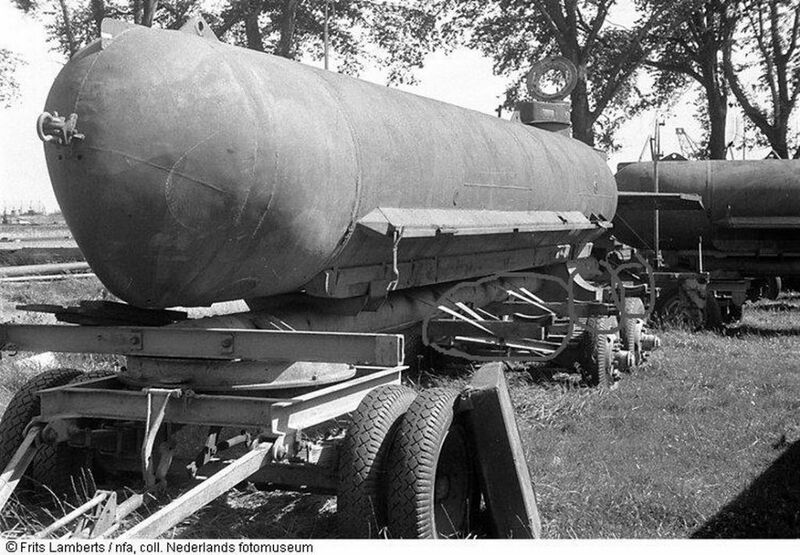 Another Flotilla was sent to the Netherlands in 1944 to operate on the Dutch coast. 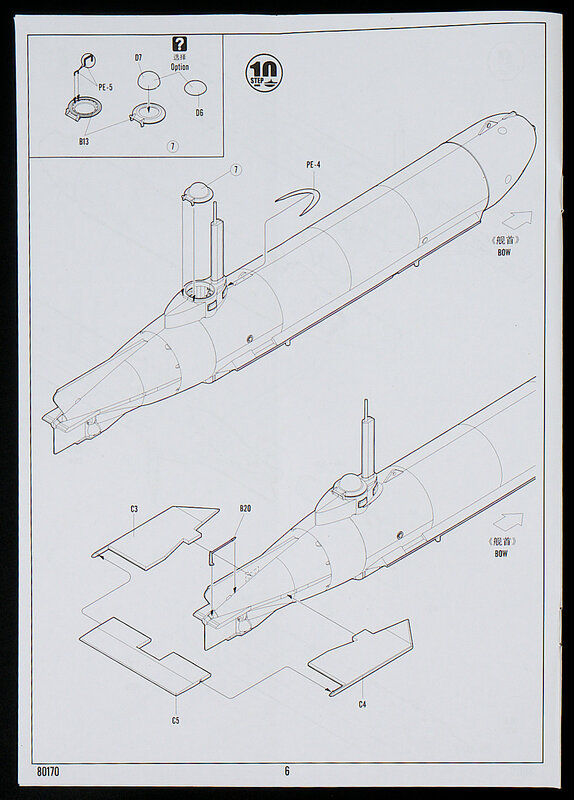 Unfortunately, the operations of the Molch U- Boat stayed unsuccessful, scoring some hits and sinking a few vessels, but compared to the men, material en cost to create mini-submarines Flotilla’s they were too much effort. 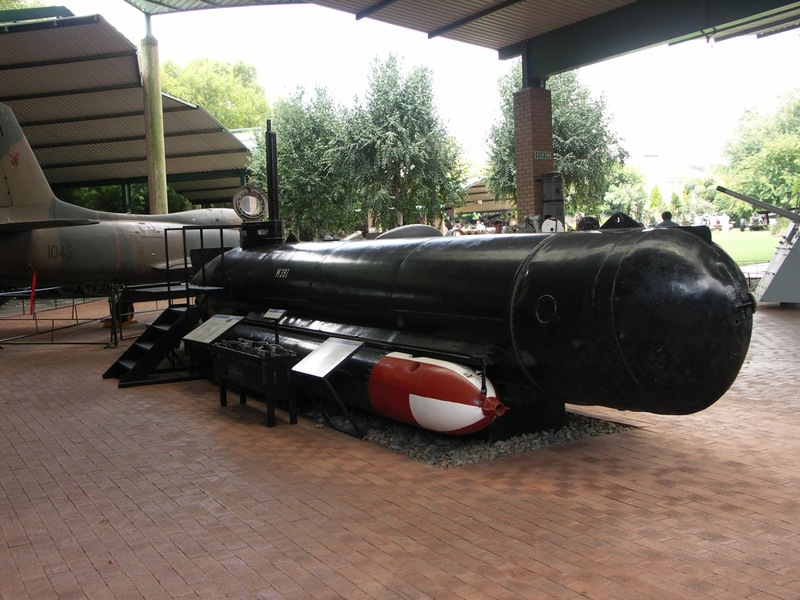 After acknowledging its failure the Molch was used as a training vessel for new U-boat Pilots. 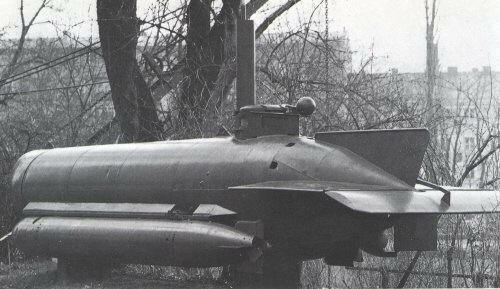 Several Molch subs - one with the nose cone off showing the forward batteries in series. 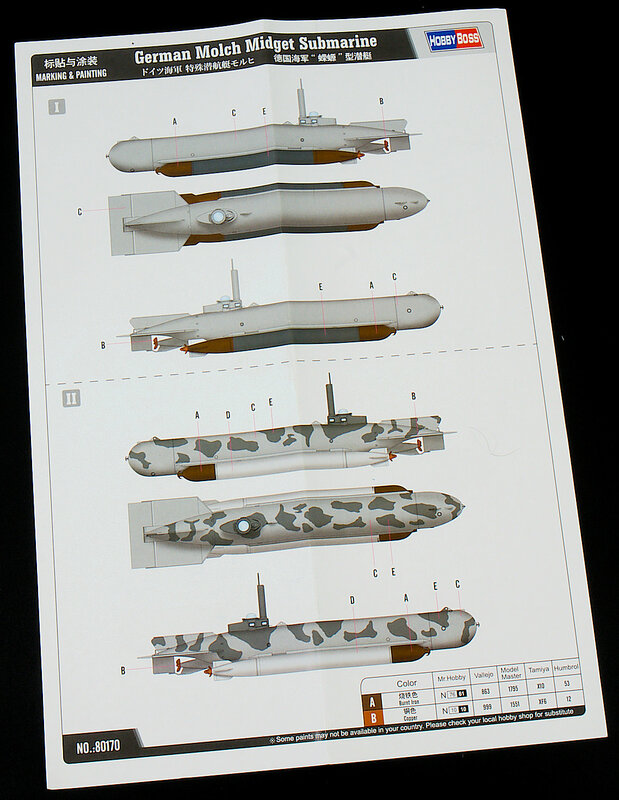 In 35th scale - the kit comes in a slim, long box, with some very blue shaded artwork. Inside the box, I was a little deflated to find not so much in there, the kit has a length of 310 mm and a width of 62mm, somehow I thought it might be larger. The kit consists of over 70 parts on 4 sprues in light grey, this includes of course instructions, decals and photo-etched parts for the finer details. 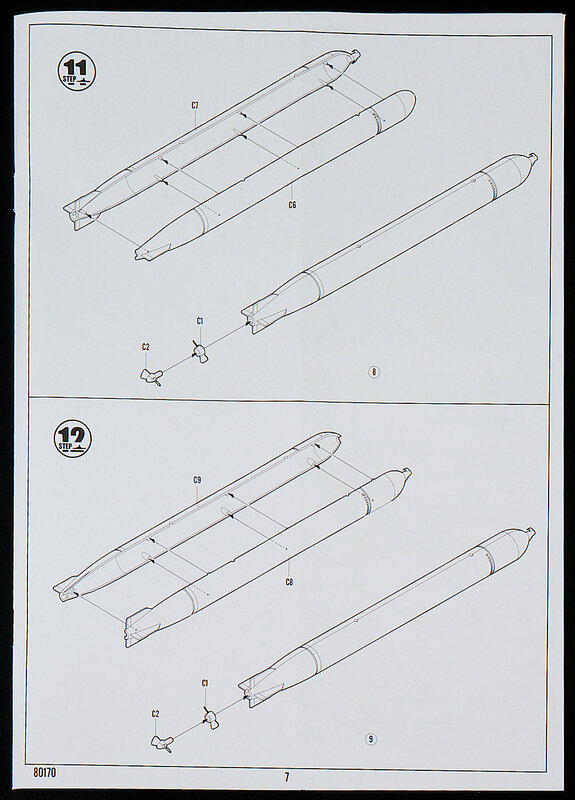 Starting at The Instructions, you can gather a lot about this kit. Printed on black and white paper in an A5 size, it contains only eight pages and thirteen steps. A simple construction and I thought we might quickly look at each page. 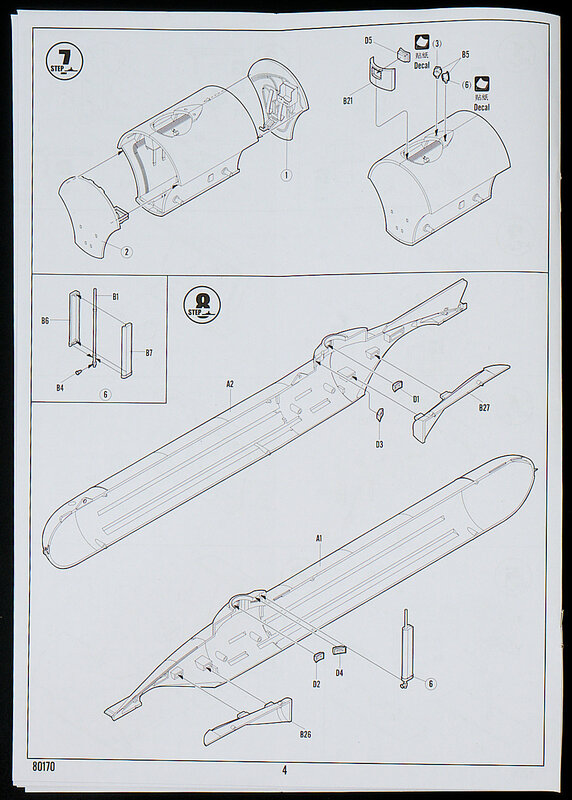 First the sprue map - noting the simple low parts count. All of these parts are to be used in this kit and I am sure this will be the only variant of this sub. Step 7 shows you why - You only see about .75cm of the cockpit once you close it all up in step seven. I know that I usually like to build and paint interiors fully, but in this case, it's just a total waste of time. concentrate on the outer shape - trust me! The cockpit tub is secured into the two halves here at step nine, from experience (because I have actually got the kit to this step after a simple night of building) you will need to test fit the two halves and maybe trim the cockpit tub to make it fit without a gap underneath the sub. The centre propeller then goes into the recess - after a lot fo sanding flush! The options for the viewing dome are next, with the control surfaces then being fitted to the rear of the sub. 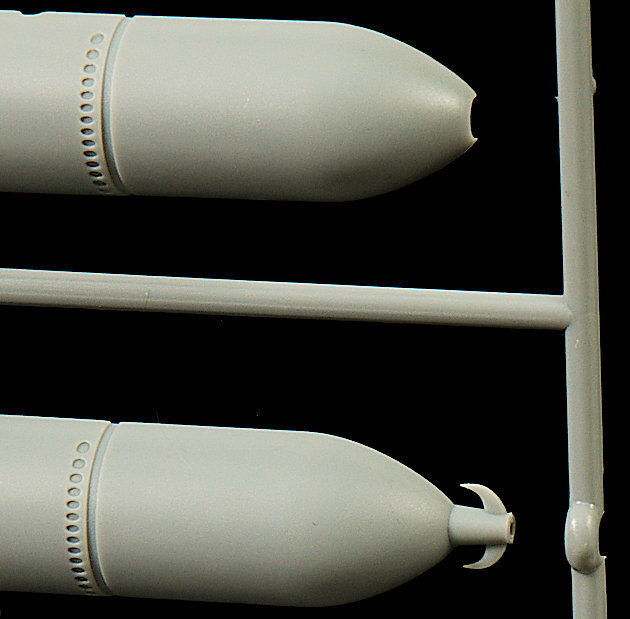 The torpedoes go together, these are a nice replica of the G7e torpedo. These two are mounted to the sub in recesses. Lastly, the simple addition of the garnishes of photo-etch and the two torpedoes, and that's it! A simple process of building this sub means that it will be a fast and easy build or a great refresher - but the proof is int he plastic - so let's have a look at it now. The two long halves of the Molch are most of what you see in the box - The surfaces are smooth, with no texture except the raised lines of the welds/joins of the sub. 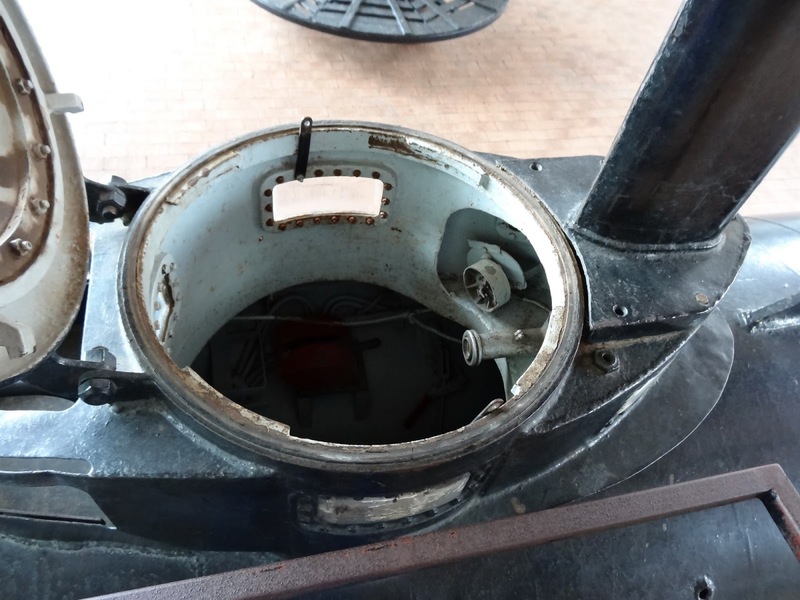 The inside of the sub is pretty barren, with slots allocate for the cockpit tub to fit into, nothing else to see here. 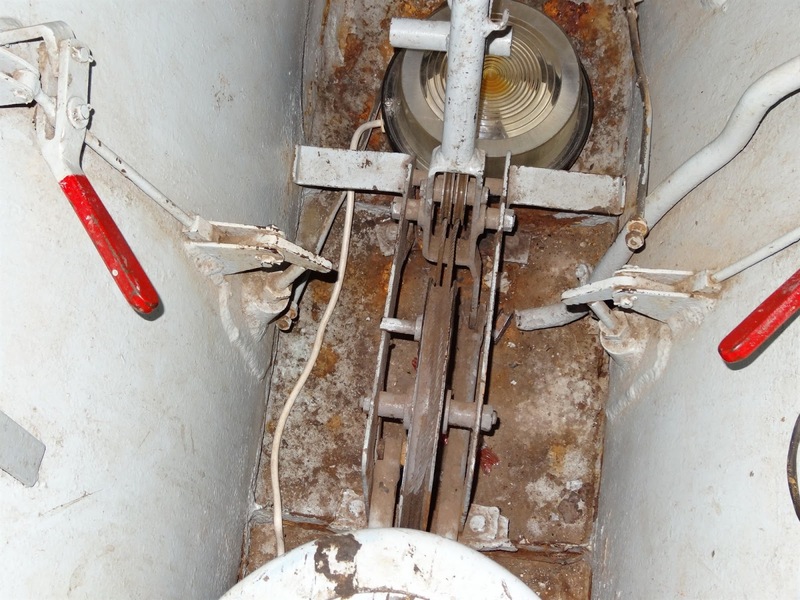 Those notches inside the sub to locate the cockpit tub. 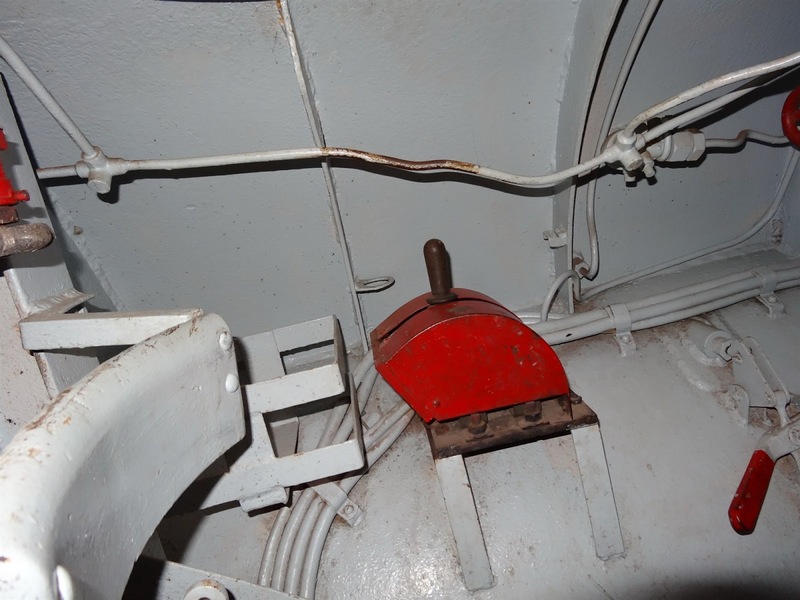 Notice the ejector marks in the inside of the "conning tower" where the sub-driver looks out from. Why these are here in the only space you will need to remove them I have no idea! They are not a big deal, but think with your head guys, it's what it's for. 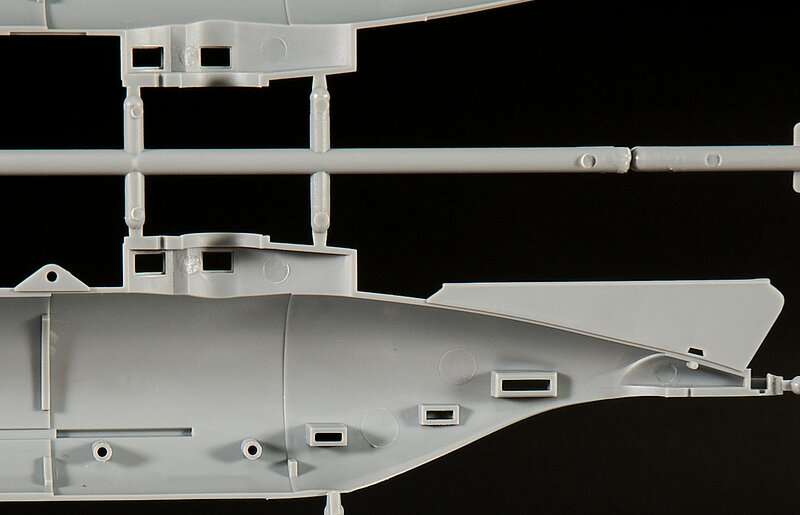 The detail on the outside of the hull in the joins of compartments is fine and varied in strength, the photo-etch on certain parts only improves this. A similar shot showing the nose from a slightly different perspective. I have seen several shots of the Molch with dents and bumps in the noose which I would replicate in my build I think. 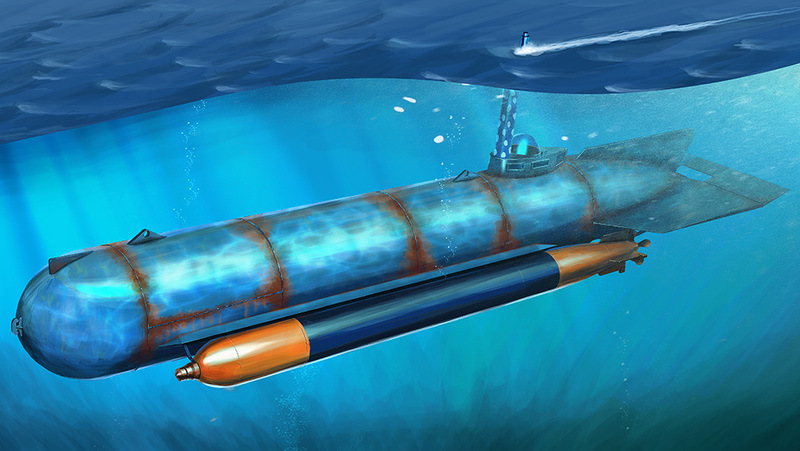 This would be caused due to the poor handling of this sub on the surface, bumping into things no doubt, and maybe a little bump into something under water. 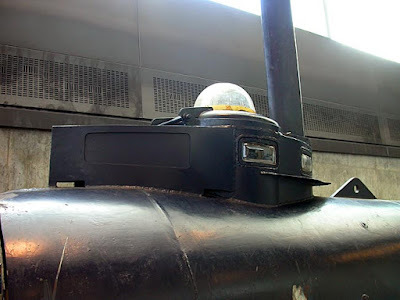 The rear of the sub showing the same raised surface detail and some vents behind the cockpit tub. From the other side showing the rear of the sub and the vents where the tail was bolted on. 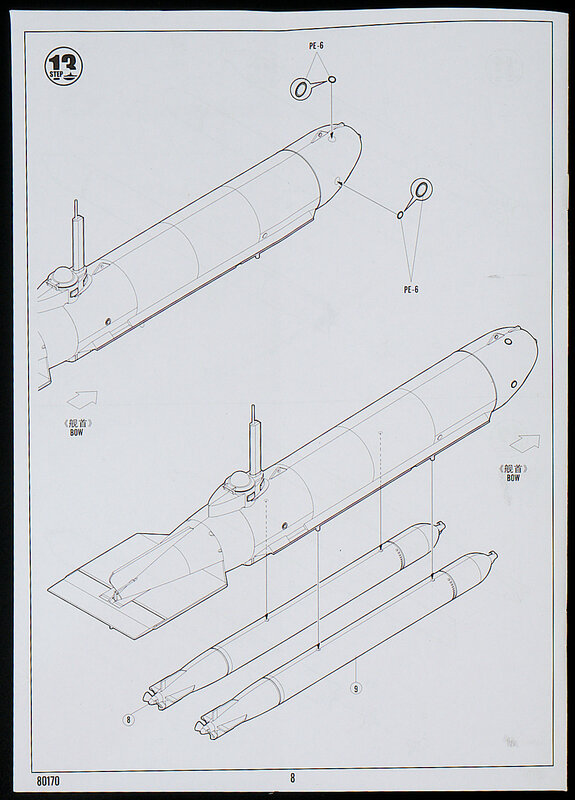 The Molch carried two torpedo’s on its lower side of the G7e type which were fired by pedals inside the submarine. The rails that housed the G7e are seen here with two notches that sit straight into the plastic replicas and hold it without glue. However, you will have to snip these off if you are showing the kit without its main armament. Sprue B is the other large sprue. This sprue houses the internal cockpit if that is what you would call it- tub with all of the controls inside. The rear propeller unit and periscope are also here. Before we look at these parts in more detail here are some pictures of the interior of the sub. none of these parts you will see when it is completed unless you take the sub in your hands and get a torch in there... 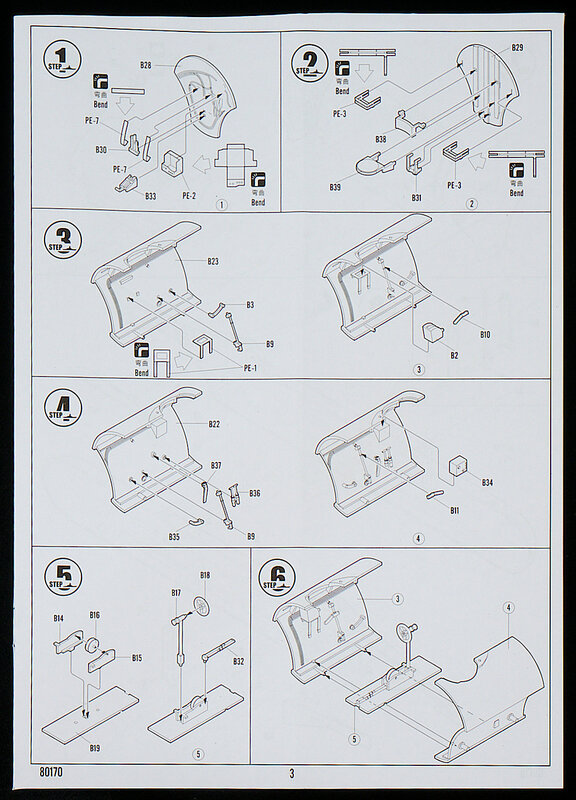 This is more for your reference, and with a mind of the parts on this particular sprue. In closer detail, you can see B8 is the propeller, while the other parts here, are the controls inside the cockpit. I wount be making any of these, but they are there. 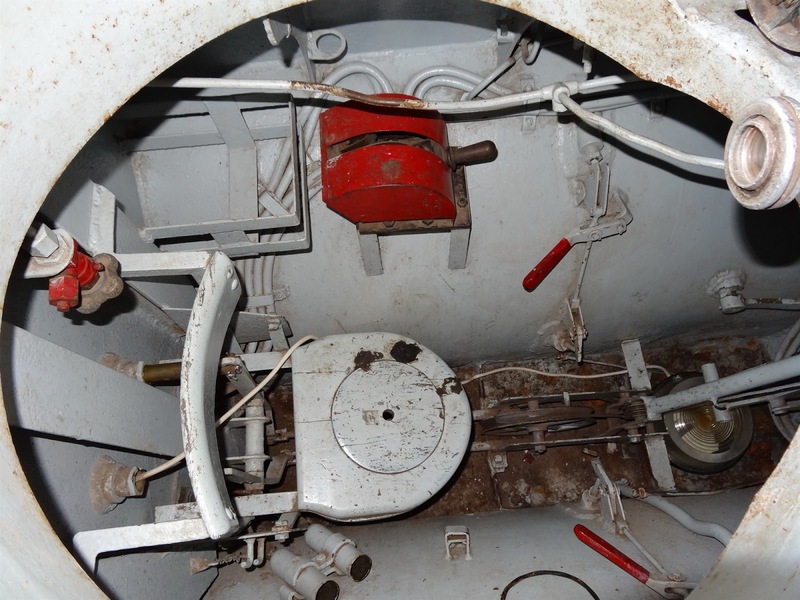 More parts of the inside of the cockpit tub, showing the front and read bulkhead walls and again several internal controls of the sub. 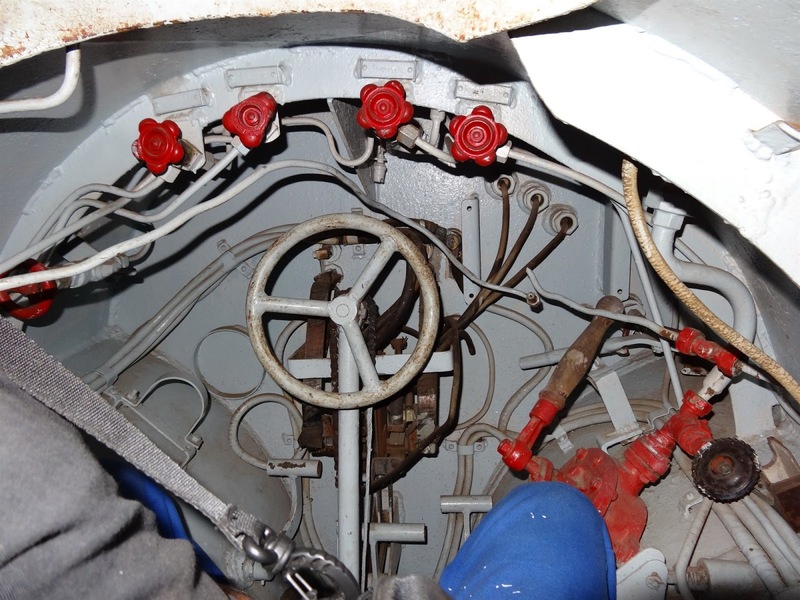 The control wheel on B18 and it's yoke on B17, the floor of the sub on B19, we see the rudder on the square part in the centre with lastly on the right-hand side the dome on the top of the turret what the transparent part sits inside. The exterior of the side walls of the cockpit tub, the notches lovat it in place. The interior of the tub - with some wires that line the wall, this is the last time you will see this guys once it gets glued together. 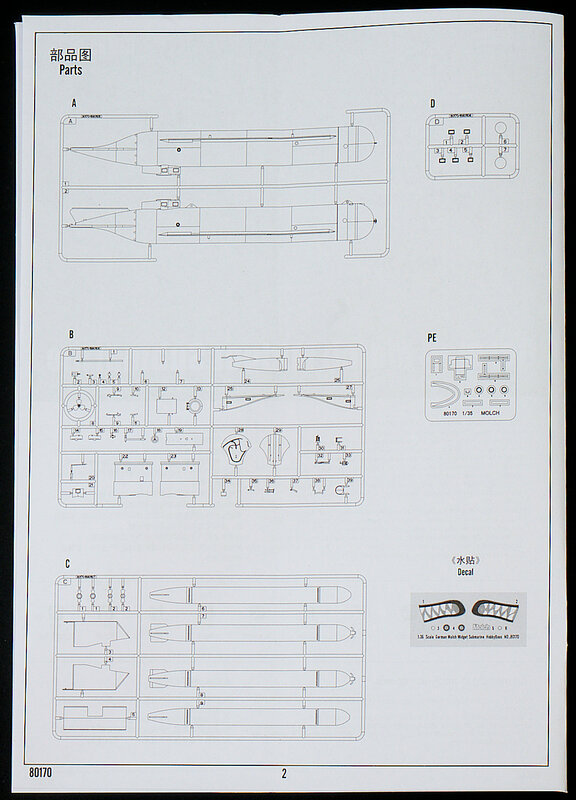 Sprue C houses the two main parts of offensive weaponry of the Molch, the two G7e Torpedoes. 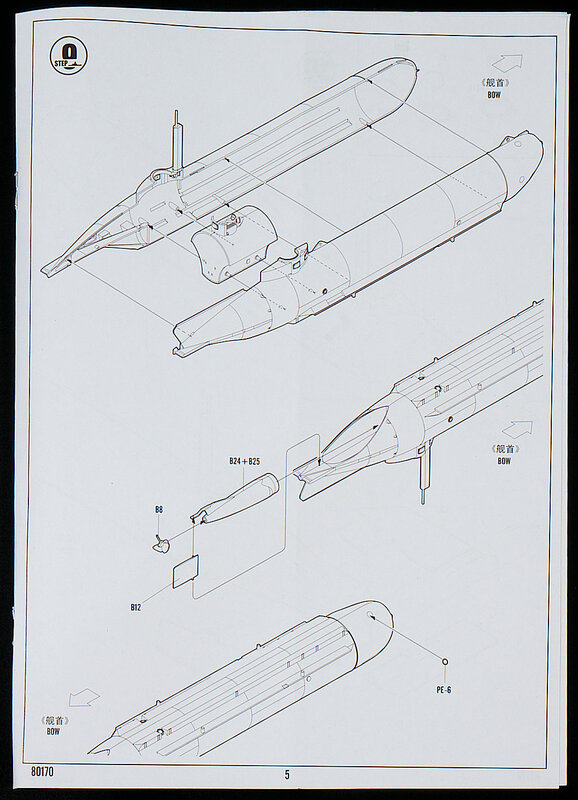 The G7e torpedo was the standard torpedo for the German Kriegsmarine during world war two. 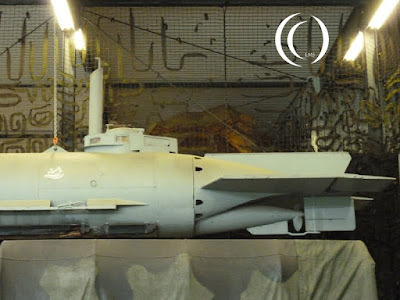 It carried 280 kilograms of explosives and was powered by an electrical engine which gave it a speed ranging from 37 to 56 km/h depending on the type of G7e torpedo used. Its operational range varied between 3 to 7,5 kilometres and some types even longer. It had a length of just over 7 meters and a diameter of 53 centimetres. 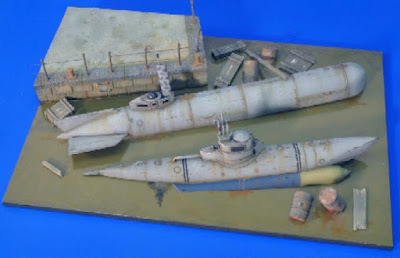 These two torpedoes simply join in half down the centre and they have two propellers what join together also on the sprue. 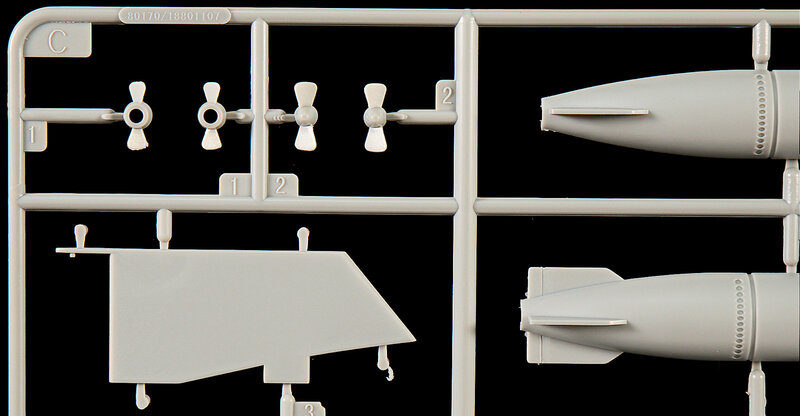 The "flying" tails of the sub are also on this sprue. 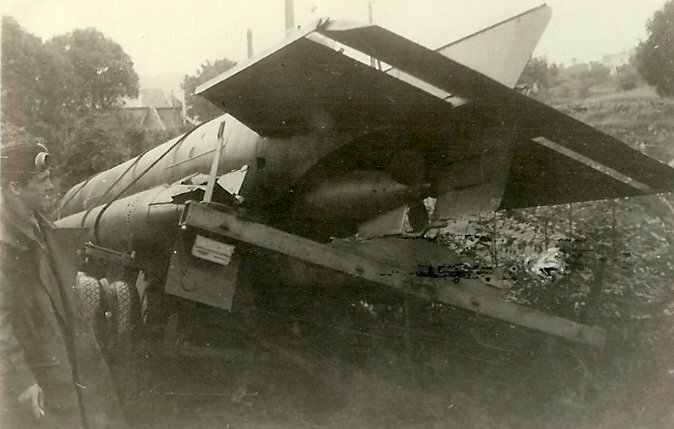 The two times two propellers, (four for both torpedoes) simply sit inside the rear of the torpedo. There is some cutting and sanding you will need to do around the corkscrews, you will also need to remove a large seam of the foils of the rear of the sub. 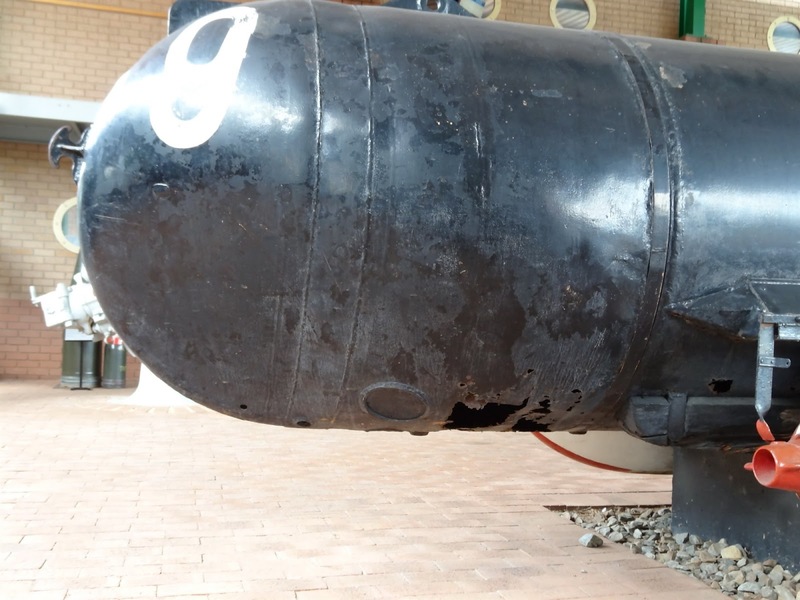 The nose of the torpedo - the head on one side fits snugly into the other side's recess. 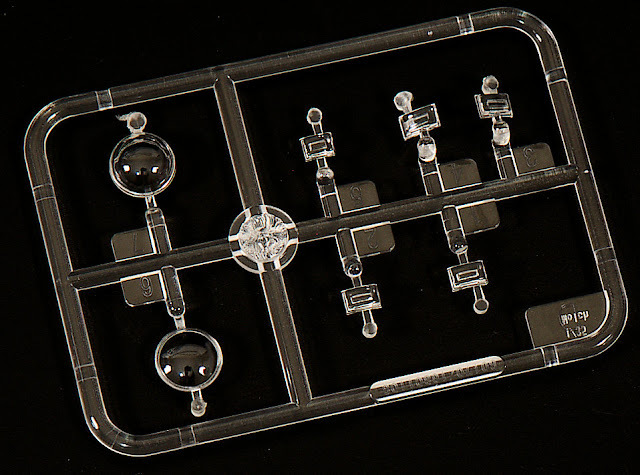 The clear sprue houses the vision orts of the tower/ hatch, also a choice of two bulged domes for the top vision port. Here at an angle, you can see both of these domes - the shallower on the left and the higher dome on the right. 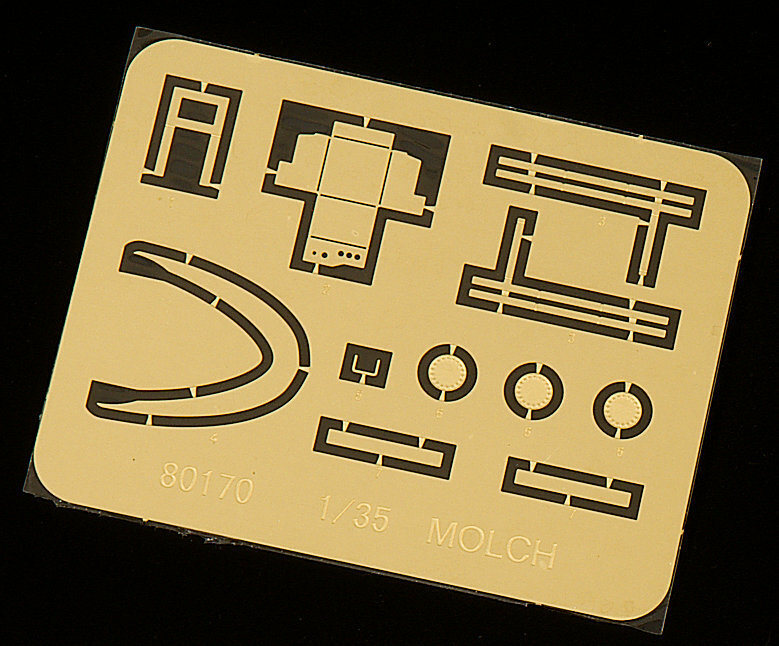 The simple photo-etch sprue contains most of the thinner parts for the inside of the cockpit tub. TO me, most of this will go unused, but some will want to make this u - that's their own choice - life is too short and the stash id too large for this modeller to get sidetracked on this unseen detail. The tower wake splitter curve and the front circular hatches are here to add more scale detail. We look att he colours of the subs next. There is not a lot of great detail showing the real colours of the sub - and none is given here on the dual-sided colour printed paper in A4. Four schemes with colours called out in Mr colour, Vallejo, Tamiya, model master and Humbrol are selected - but no other information is here. 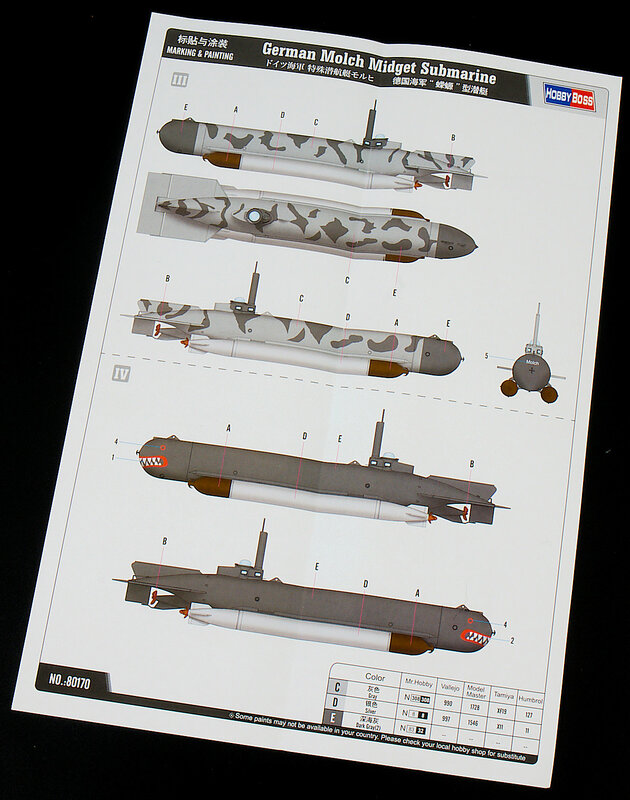 The decal sheet that accompanies these schemes is OK, well printed, but nothing too colourful and who knows if it is accurate to a submarine in the camo schemes? I don't after a lot of searching. I like the subject, the kit is a simple construction, and a fun diversion for many people, but one question strikes me as I am building it - how to display it? 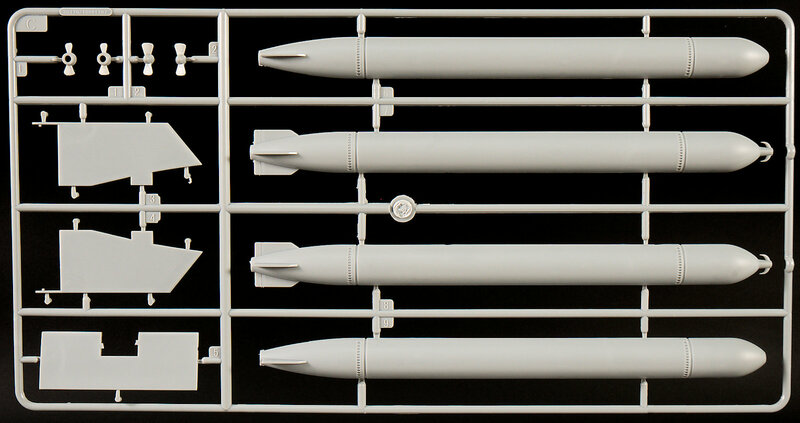 The older Mir Models kit might look like an simpler effort - but it DOES have a stand included. The simple inclusion of a stand would make me think that the model makers cared about thinking about this aspect of displaying the kit. I don't think they did think about this aspect of the finished product in this case. The model is nice enough, I will have to add a little and do some thinning out in some places - I am making it right now - so we will see how it builds up in part II of the article soon to come. 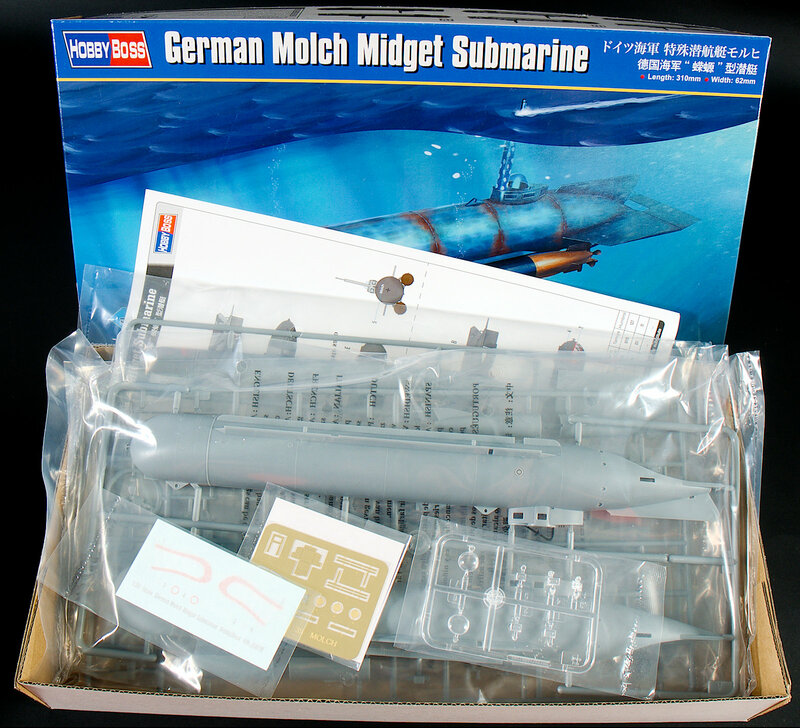 More of Hobbyboss' kits can be found at their website.